"Smog chokes Delhi", declared the the New York Times on November 7 2016, informing readers around the world that contaminating particulates in the air in the Indian capital had "soared in some places to...more than 16 times the limit India's government considers safe." I was in Delhi at the time for my niece's wedding. Visibility was virtually nil - 100 metres at best - and, devastatingly, winds were calm. Schools were closed for three days. Experts said that crop burning in neighbouring Haryana and Punjab states, car emissions, construction and the use of fireworks during the traditional Hindu festival of Diwali had caused the pollution, which, in my observation, ranks as one of India's worst ever. To get the situation under control, the Indian government announced it would temporarily shut down construction sites and a coal-fired power station. As a former Delhi resident and forestry researcher, I felt a personal obligation to better understand this crisis - ideally so India can avoid a repeat this coming November. I started gathering all available data about pollution levels in Delhi, obtaining hourly and daily air-quality levels from India's Central Pollution Control Board and, from NASA, snapshots of crop-burning for November 2016. I dug into the details, using pollution images to validate the collected data. The analysis took me six months. Here's what I found. Pollution is a complex phenomenon involving numerous molecules, including particulate matter (PM), ozone, carbon monoxide, sulphur dioxide, nitrogen dioxide, and variables, like wind speed, temperature, rain and humidity. I found that during Delhi's 2016 pre-monsoon and monsoon season, which is February through September, air pollution based on fine particulate matter (PM 2.5, the most hazardous contaminate) dropped as wind speed increased. 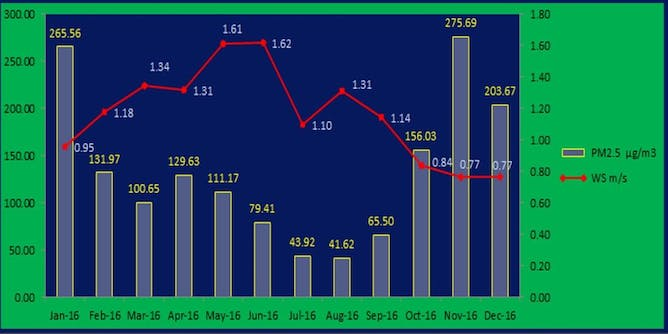 Likewise, air pollution rose in October, November and December 2016, as wind speed decreased. Particulate levels spike in November, which coincided with the Diwali festival and then with a spate of crop-burning in rural areas near Delhi. As Figure 2 shows, there was a visible relationship between average daily wind speed and pollution levels in Delhi from late October through mid-November 2016. On November 6 2016, wind speed was the lowest of any day during that period, an average of 0.46 metres per second (m/sec). That day, PM 2.5 reached as high as 713 micrograms per cubic metre, prompting international headlines. As average wind speed increased between November 6 and 7 from 0.46 m/sec to a very light breeze of 0.74 m/sec, the pollution level dropped by 38.4%. November 7 and November 8 followed the same trend, with average wind speed of 1.25 m/sec leading PM 2.5 to again drop, this time 56% from peak levels. Wind is not the only factor in air pollution, of course. What goes into the air matters, too. In Haryana and Punjab states to the north of Delhi, farmers commonly burn their remaining crops in fall, after the summer harvest ends, ridding their fields of stubble, weed and pests and readying them for winter planting. This agricultural event coincides with Diwali, India's festival of lights, which features three or four nights of fireworks before and after the festival, in October or early November. 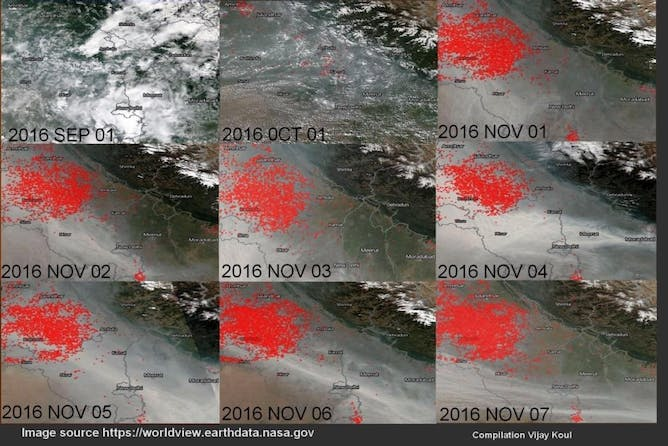 I analysed snapshots of data from NASA compiled for September 1 (no fires yet in Haryana and Punjab), October 1 (start of fires) and the first week of November in 2016. The data confirms that the days of highest pollution levels in Delhi (November 1 to November 7) coincided with large-scale residue crop-burning to the city's northwest and, to a lesser degree, south. Wind-direction data from the Central Pollution Control Board in Rothak, Haryana, between November 1 and November 7 show that, on those days, the wind blew primarily east and east-southeast - that is, towards Delhi. My research confirms, in great detail, that the main elements of Delhi's record-breaking pollution levels in November 2016 were lower wind speeds, the use of fireworks during Diwali, residue crop-burning and wind direction. These factors may well coincide once again in November, the month of lowest average wind speeds in Delhi according to meteorological data. That gives Indian policy-makers and Delhi residents just under four months to take action. Strictly limiting residue crop-burning, celebratory firecrackers and major construction in November may safeguard the city against another air-quality disaster. Regulations may include a total ban (perhaps with financial compensation for the inconvenience) on residue crop burning during October and November in Haryana and Punjab, and rationing fire crackers during Diwali. Other countries have taken measures to limit crop-burning. In Victoria, Australia, the state government strongly encourages farmers to adopt conservation farming systems, including retaining crop stubble residues, but allows burning sporadically. And in some Canadian provinces, stubble-burning is allowed by permit only. There is no such legislation is under consideration in India. The government has come up with a seeder that can be used to plant wheat without the need to dispose of the straw left after the rice harvest. But even with financial help farmers can't afford this expensive new technology. Pending regulation, raising the general public's awareness of the issue could help. By printing pamphlets about pollution and its effects on air quality and health, as well by informing people of the daily trends of pollution through TV, radio and social media, India's government could help teach farmers in hard-to-reach rural India about the impact of their actions. Delhi - and India in general - can no longer afford to do nothing.